Historical Background of the Book. 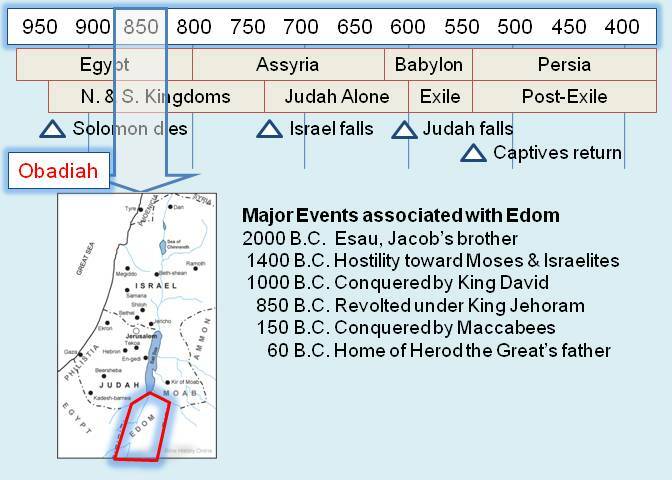 Southwest of the Dead Sea lived a group of people called the Edomites. They were the descendants of Esau who lived around 2000 B.C. and who was the brother of Jacob (also called Israel) and son of Isaac and Rebecca (Gen. 25:19-34). When Jacob's descendants (the nation of Israel) were migrating from Egypt to the land of Canaan around 1400 B.C., the Edomites refused to allow Moses and the Israelites passage through their land (Num. 20:14). About 400 years later, King David conquered them (2 Sam. 8:14). Around 850 B.C. they revolted under King Jehoram (2 Kings 8:16-21). They were again conquered by the Maccabees around 150 B.C. The area occupied by the Edomites is also known as Idumea and was the home of Antipater, the father of Herod the Great, who was ruling in Jerusalem when Jesus was born around 8 B.C. to 4 B.C. The date the book of Obadiah is somewhat uncertain. Some scholars (as reflected in this survey) believe it may have been written around 850 B.C. (roughly 80 years after King Solomon's death). As part of their rebellion against Judah, they may have been supporting some of the Gentile nations who were harassing and attacking Judah. The Author and the Audience. The Bible does not reveal anything regarding the prophet Obadiah. His book was written to the Edomites. As the shortest book in the Old Testament (21 verses in a single chapter), its purpose is to condemn them in supporting the Gentiles against Judah. Both OT and NT warn about rejoicing over the misfortune of another (Prov. 17:5; Job 31:29-30; Matt. 5:43-48). Although often oppressed, God's people will ultimately triumph (Mark 10:28-30; 2 Tim. 3:10-17).